Calling the case a referendum on “the right to say no,” residents of several rural villages along the country’s eastern coast are asking the court to reinterpret current minerals extraction legislation to compel mining companies to gain explicit community consent prior to breaking ground on new operations. 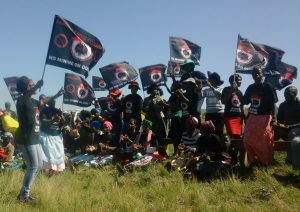 The court case, for which arguments were heard in late April in Pretoria, stems from a dispute over a proposed titanium mine that has raged for more than a decade in the country’s rural Eastern Cape province in an area known as the “Wild Coast.” The project has pitted Australian mining company Mineral Commodities Ltd against a group of five local villages, collectively known as Amadiba. Locals consistently turned back the company’s attempts to mine, but bouts of violence have left several people dead. Nonhle Mbuthuma is the secretary and acting leader of the Amadiba Crisis Committee, which represents many residents of the villages. 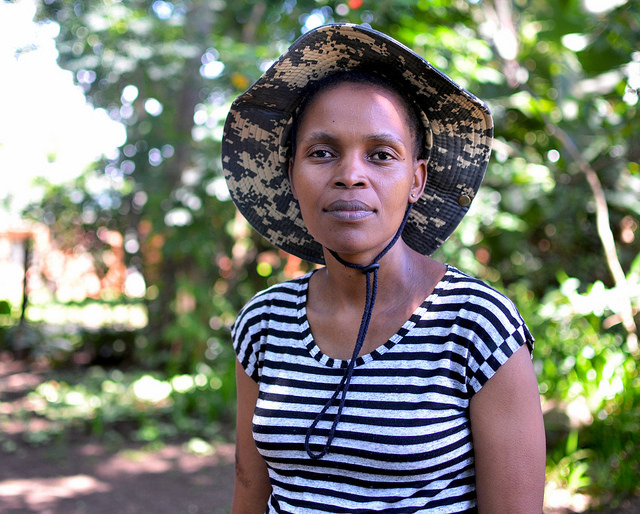 She took over the group’s mantle of leadership when the committee’s chairperson, Sikhosiphi ‘Bazooka’ Radebe, was gunned down in front of his home in March 2016. Radebe was widely thought to have been murdered for his activism against the mine, and Mbuthuma’s name is believed to be written on a hit list alongside his. “The land is our identity. When we lose that land, we lose who we are. And when you lose who you are, that’s no different than just someone killing you,” Mbuthuma said. The communities and civil society organizations that have joined the plaintiffs asked that if the court does not side with their argument for consent, that it at least grants them the ability to negotiate terms such as royalties prior to mining. If the court declines that too, then the plaintiffs asked that the current legislation be found unconstitutional. “We hope that if the judge rules in favor of us, it will help all African communities, not only Xolobeni, because the problem of mining pushing people off their land is all over Africa,” Mbuthuma said, referencing one of the five villages in Amadiba that has become synonymous with the conflict. Formerly under the control of the oppressive apartheid system, South Africa democratically elected a new government in 1994, which worked to return the country’s mineral wealth to its citizens while also fitting into international, capitalist markets. Under current legislation, mineral rights were claimed for the state in an attempt to foster economic development. However, as the government handed out mining licenses, conflicts arose between mining companies and rural communities living on communal land. About 13 percent of the country’s land area remains held communally in the vestiges of apartheid-era “homelands” that were created as sham independent states to remove black South Africans from urban areas. An estimated 18 million South Africans live on these lands. Traditional leaders such as chiefs, kings and queens and councils preside over communal land, but their mandate comes from the people, according to customary law. In this set of laws, these leaders cannot make decisions for their communities without the consent of the people. In many cases, though, traditional leaders strike deals with mining companies that open up communal land to mining, often without community-level consent. This happened in Amadiba, where one chief supported the proposed mine and was made a director of a company linked to the project. In return, the chief said in a signed statement provided to the South African Police Service, he was promised that challenges to his chieftaincy would disappear and that he would earn profits from the mine. Through a company spokesperson, Mineral Commodities CEO Mark Caruso declined to comment for this story. Johan Lorenzen is an associate at Richard Spoor Inc. Attorneys, which is part of the community’s legal team. He said that such conflicts are common in rural areas that are struggling to realize the full benefits of a democratic South Africa. “The majority of rural South Africans live on communal land such as the Amadiba community. Particularly as the world’s largest platinum producer, South Africa has seen a wave of mining right applications over customary land, and, without clarity over this question of whether there’s the right to say no, it has had sweeping effects on tens-of-thousands of people in rural South Africa,” Lorenzen said. He estimates a judgement will be delivered in several months. The minister of the Department of Mineral Resources announced an 18-month moratorium that temporarily halted both the project as well as any new permit applications for the area. That is set to expire later this year, and it remains unclear what will happen when it does. As part of the moratorium, the department committed to commission “independent social specialist/s to…investigate the deeply rooted cause of the problems and document the causes and possible solutions” of conflict surrounding the mine. In a statement to IPS, the department admitted to eschewing that obligation. “There was no independent investigation conducted, due to the well-publicised challenges between the parties in the area,” the statement said, also noting that the department was yet to decide whether to renew the moratorium. As an alternative way of elevating these residents’ voices, British photographer Thom Pierce recently shot a series of portraits of Xolobeni residents and made the frames into postcards that he plans to mail to the minister of the Department of Mineral Resources. On the postcards, community members described the importance of holding the final say over their own land. Themba Yalo invoked the memory of the Pondoland Revolt, a 1960s uprising where residents of Amadiba and surrounding communities took up arms against the apartheid government and its supporters. “My grandparents fought for this land, for me to live freely. I will never agree to a mine coming here and destroying the land and the graves of my family,” he wrote. The post South African Lawsuit Could Bring Sweeping Changes to Land and Mining Rights appeared first on Inter Press Service.